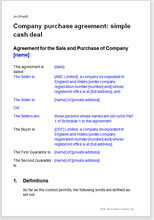 This is a simple agreement where payment is in cash. It has been drawn to protect the buyer’s interests, but a seller could take advantage by submitting an edited version to the buyer. The warranties are extensive but straightforward. Within the document there is no provision for real property, conditional payment, withholding of part payment or sale of subsidiaries. We include many optional warranties that are designed to protect a buyer with imperfect information about the state of the business. If you are the buyer, you should leave these in place where relevant because they give you protection against having not been told something that affects the value. If you are the seller, you may want to remove some of these so as to leave fewer points on which a buyer may subsequently come back and claim that you failed to disclose material information. The agreement complies with the requirements of the Companies Act 1993.